Smoked Brisket is one of the best barbecue dishes that can ever be made. Follow these steps to achieve the results that you seek. Good brisked takes time and smoked beef brisket takes even more time if you want it to achieve the peak of flavor. So prepare your brisket keeping in mind that marinating for at least 8 hours is a general requirement. Marinating for this period will allow the flavor to deepen while breaking down the muscle fibers of the meat. In addition to a marinating a good rub goes miles farther than just using basic salt and pepper. Jake's Famous produces three really great dry rubs that can be used on brisket. Jake's Famous Santa Barbara Smoked Rub, Jake's Tri Tip, Steak and Rib Rub and Jake's Famous Pure Santa Maria Dry Rub. Each rub creates and rich deep flavor in the meat and is designed for long term marinating. Apply a the rub generously on both sides of the meat. It is a good idea to have at least 12 - 16 ounces of dry rub available when making brisket depending ont he size of the brisket. The meat must be coated completely to deliver maximum flavor. Once rubbed wrap it tightly in foil, and put it away in the refrigerator overnight. Wrapping will help when placing the meat in the smoker. When the brisket has marinated and you are ready to smoke ensure that your smoker is up to temperature at least 225 degrees. Keep in mind that once you open the door or raised the lid the smoker will take at least 5 minutes to stabilize the temperature back to 225 degrees. Once the brisket is on the smoker remove the brisket from the foil and place directly on the rack. 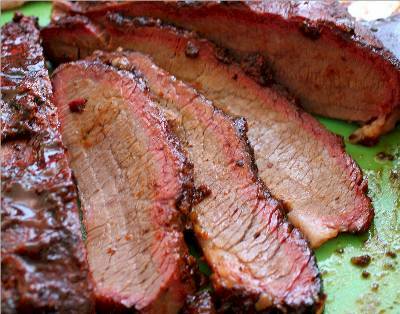 A basic brisket will take between 1 and 1-1/2 hours per pound to cook. Once you've estimated your cooking time per wait the effort shifts to heat management. It would be wise to check the temperature of the smoker every 45 minutes to one hour. If the smoker uses charcoal preheat the charcoal in a chimney stack before adding to the smoker box. If the smoker uses wood consider adding more wood every 45 minutes to an hour. Some say the wood should be soaked in water then placed on the burning wood below it. Others think that the flavor will be dampened by wetting the wood and therefore focus on dry wood application to their fire. It's up to you to choose the method that works best. After about 3 hours of smoking turn the brisket over. It's a good idea to start the smoke process on the side of the meat that has less fat. Then turning over the brisket finishing it on the fat side. This process helps deliver added moistness to the meat early in the cooking process. After cooking for the additional time begin checking the temperature of the meat every 45 minutes. Look for an internal temperature above 175 degrees. This would be considered very well done for average beef but is considered medium rare of brisket. Brisket similar to Sirloin needs to cook at a higher temperature. Bring the brisket to at least 185 degrees measuring in multiple locations along the meat. Once temperature is reached layout enough foil to cover the meat completely. Remove the meat and wrap in foil and place on a cooking sheet at room temperature. Leave the brisket for at least 15 minutes to firm up the meat and to ensure that the juiciness is retained. After the resting period remove the foil and place on a carving board or large plate. Carve the meat against the grain in slices at least 1/4 inch thick. Taste and record your Beef Brisket results for future cooking.